Be attuned and trained to become a confident Reiki Master Practitioner, spending 12 months really honing your skill, knowledge and wisdom. Be trained and prepared to begin working professionally as a confident Reiki Master Practitioner, if it is what you want to do, and receive a free website, built just for you! Run as 4 x full day workshops over the course of a year, there is plenty of time for you to develop and practise your skills and become confident. Coursework is set between each worksop, run every three months, that lets you develop and learn in stages that gently and powerfully allow you to become a true Reiki Master Practitioner. By the end of this course, you will know, with personal experience and research, what reiki has to offer and how you can personally offer it based on your individual perspective. 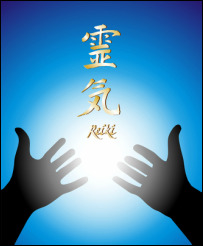 What is a Reiki 3 Master? As part of the course, you are entitled to a FREE website setup so that your professional Reiki practise can begin as soon as you have finished! Ask us how your other modalities may also be included too. Complete Vibrational Therapies is pleased to hold approved training provider status for all of it's Reiki certificates with the International Institute for Complementary Therapists. As a student of Complete Vibrational therapies, you will be able to apply for student membership with IICT and be eligible to apply for relevant discounted student insurance. Once qualified, you will be able to become a full Member of IICT and apply to gain discounted professional insurance. Participating in a Reiki 3 Master course is a powerful step towards working in the alternative therapies industry. It is a deeply rewarding and life-changing experience may inspire powerful internal changes of both those you work with and yourself, assisting to re-allignment with soul purpose. Regardless of whether you wish to give reiki treatments to other people, or simply use reiki as a way to open yourself up for further personal/spiritual growth, Reiki 3 Master Practitioner course it is perfect for you. You don't have your included website published if you don't want to. Reiki is one of the most well-know energetic treatment modalities and is often the first modality that we undertake when journeying along our spiritual path. Reiki 3 Master Course is the third step along this journey. Some people continue on to complete Reiki 4 Master/Teacher Course in order to teach Reiki to other students, however it is not necessary. Receive guidance and support with the course work so that it is easy to understand and issued in manageable chunks as to not be overwhelming. People commonly complete a reiki course saying that they feel energetically balanced and charged. They often comment on positive internal changes that occur throughout the reiki workshop, that motivate them to move forward in their lives. A sense of peace and tranquility is said to influence them.